When Lance Armstrong celebrated his record-breaking seventh Tour de France title in 2005, he made the following prescient speech: "I'll say to the people who don't believe, the cynics and the sceptics: I'm sorry for you. I'm sorry you don't believe in miracles." It was vintage Armstrong, at once belittling his critics, burnishing his own legend and scripting another Hollywood-ready line to a story that spoke only of heroism and sporting immortality. That golden narrative, weakened and wobbled over the intervening years by a drip-drip of accusation, evidence and testimony, may now have been washed away forever. The US Anti-Doping Agency's long-awaited report into the methods used by Armstrong and his team-mates to achieve his sainted status is unequivocal. The report describes those methods as "the most sophisticated, professionalised and successful doping programme that sport has ever seen", run by a "serial cheat" through "the use, administration and trafficking of performance-enhancing drugs and methods". Armstrong, a modern-day American icon way beyond the narrow confines of his tainted sport, is accused of not just fixing a race, or a match, or even a season. He has fixed an era. He has duped a nation. "Say it ain't so, Joe," that young Chicago White Sox fan is supposed to have asked of 'Shoeless' Joe Jackson as the first great American sporting scandal broke almost a century ago. Is there a chance, Lance? Could Armstrong emerge from this storm still clinging to his halo, with any semblance of his reputation still intact? His lawyers have declared Usada's report a witch-hunt, a kangaroo court "based largely on axe-grinders, serial perjurers, coerced testimony, sweetheart deals and threat-induced stories". The 1,000 pages of forensic evidence would suggest otherwise. Armstrong acolytes might scoff at the testimony of self-confessed dopers Tyler Hamilton and Floyd Landis, even if others would not. But those two are joined by nine other former US Postal team-mates, including such loyal lieutenants as George Hincapie, Frankie Andreu and Levi Leipheimer. Between them they describe, in rich, grotesque detail, both the broad scope and the daily minutiae of an unprecedented doping regime. Alongside them stand thousands of words of scientific evidence, financial records and email exchanges. It is exhaustive, meticulous and damning. Another line used by Armstrong advocates is that he was doing nothing that his rivals weren't, that in a muddy playing-field made level by universal doping he was still the best rider, the toughest in training, the worthiest winner. Usada's report renders this myth untenable. "The USPS Team doping conspiracy," states chief executive Travis Tygart, "was professionally designed to groom and pressure athletes to use dangerous drugs, to evade detection, to ensure its secrecy and ultimately gain an unfair competitive advantage through superior doping practices." Armstrong, it is made clear, was not a helpless pawn forced by others to cheat to keep up. He was an instigator, a ring-leader and a pioneer. In Dr Michele Ferrari, he harnessed himself to the dark master of doping science, paying the most to work with the best, less dancing to another's tune than writing and playing it himself. Those who tried to ride clean - "pan y agua", in the sport's parlance - were left with no chance. Perhaps the most unpalatable paragraphs in the report relate to Armstrong's coercion of younger riders. Christian Vande Velde, dropped from US Postal for the 2002 Tour, says he was told by his compatriot and mentor that "if I wanted to continue to ride for the Postal Service team I would have to use what Dr Ferrari had been telling me to use, and would have to follow Dr Ferrari's program to the letter". Both Michael Barry and Dave Zabriskie were also lured in by Armstrong and team director Johan Bruyneel. Zabriskie, who as a kid had used cycling as an escape from his father's own drug addiction, admits in his testimony that he "went back to my apartment and had a breakdown" after finally succumbing to the pressure to dope himself. 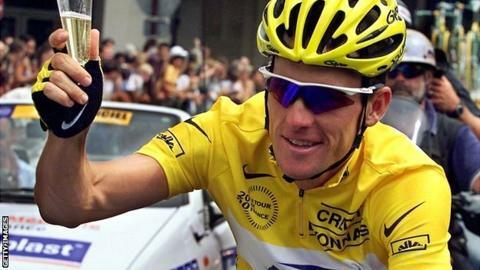 Armstrong has frequently stated that he passed more than 500 drug-tests during his career. It is another defence exploded by Usada's relentless detail. Not only was that number probably closer to 250, but so easy were the tests to evade or deceive that it appears Armstrong often found it comical. There was no test for EPO until 2000. The window for detection, when there was, was tiny; when Ferrari advised injection direct into the vein rather than skin, it almost closed entirely. Blood transfusions remained undetectable. When testers were on their way, Armstrong and his team frequently knew in advance; when they did arrive, saline drips could mask any evidence. Neither was Armstrong's doping a one-off reaction to unrelenting external pressure. He doped before cancer; he doped after cancer; he doped through his glory years; and he doped in his comeback. His blood values in his valedictory 2009 and 2010 Tours, state an expert, had "less than a one in a million chance" of being natural. There is more - the intimidation by Armstrong and his handlers of witnesses and their vitriolic attacks on critics, what Usada calls "a massive and long-running scheme to cover their tracks, tarnish reputations, lie to hearing panels and the press and do whatever was necessary to conceal the truth". There are payments of $100,000 and $25,000 to the UCI, cycling's governing body, to supposedly - and disturbingly - assist in anti-doping efforts. For some, none of that matters. Armstrong, through his foundation, has raised an estimated $500m to fight cancer. That is enough, for those unsurprised or unmoved by sporting fraud, to forever hold him in unquestionable esteem. Others may struggle with the contradictions of a man ostensibly promoting health while compelling team-mates to take illegal and untested drugs, of a fund-raiser who ran a team that fraudulently received "tens of millions of American taxpayer dollars in funding", of an inspirational figure who cheated to achieve the very triumphs he is venerated for. Armstrong's comeback from cancer to dominate the world's toughest bike race was such a wonderful story that people want to believe that it is true. So great a hero was he to so many that some are still reluctant not to. Heroes are often nuanced. Other greats have also ascended to the heights on tarnished wings - sprinters Ben Johnson and Marion Jones,baseball player Barry Bonds. Armstrong, no simple doper but the head of an organisation that fostered and administered it, now appears to have gone far beyond their nefarious deeds. At least he told the truth about one thing: it wasn't about the bike, after all. Will he ever come clean, as each of his team-mates finally has? The US culture of celebrity confession and subsequent forgiveness offers him one path out of this mess, his foundation another. Until then, he is likely to remain trapped in ever more outlandish, embittered denials, lost to the real world, fighting a battle already lost.